Sheriff John Urquhart fired back at a former deputy who has accused Urquhart of groping him, filing a lawsuit that contends the allegations are malicious, politically motivated lies made “for the purpose of causing substantial and irreparable harm” to derail the sheriff’s re-election bid. 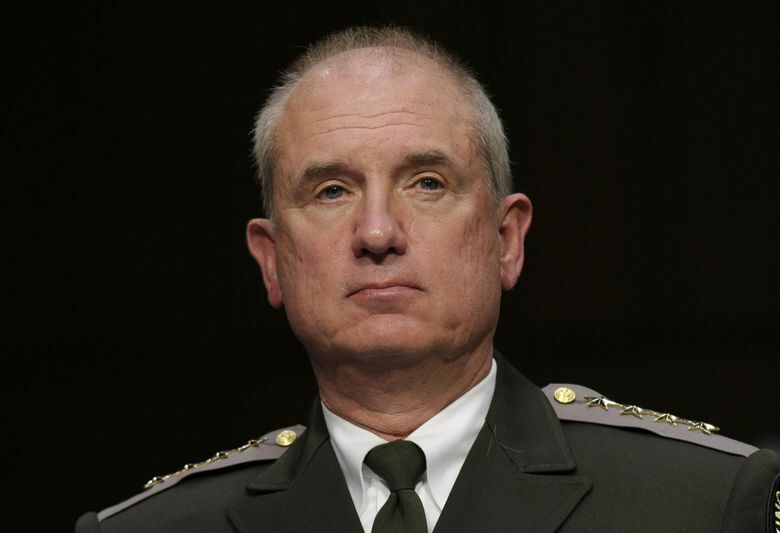 “Deputy Barnes’s malicious intent is substantiated by his more than 15-year habit and routine practice of targeting superiors with false complaints,” alleges the sheriff’s lawsuit filed Wednesday in King County Superior Court. Barnes declined to comment Thursday. Barnes, 49, now a college-campus police officer in Massachusetts, formally complained to the Sheriff’s Office in September that Urquhart groped him in 2014 in the parking lot of a Renton restaurant. Barnes voluntarily resigned as a deputy in 2015 after King County paid him more than $160,000 as part of an unusual settlement that failed to receive a required approval from King County Executive Dow Constantine. Urquhart and the county’s risk manager say that was a mistake, but Barnes contends the settlement was structured purposely to avoid scrutiny and as a way to silence his attempts to expose wrongdoing in the Sheriff’s Office. Barnes’ groping allegation has since been referred to the Renton Police Department, which has said it is conducting a criminal investigation that will be submitted to prosecutors for a filing decision. 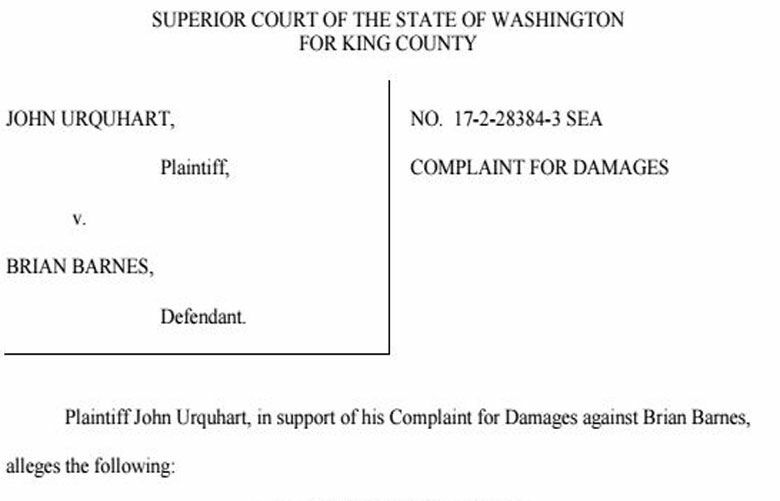 Urquhart’s lawsuit alleges that along with making defamatory statements to The Seattle Times, Barnes has “published numerous Facebook posts falsely and maliciously stating that Sheriff Urquhart has committed crimes of sexual assault” under pseudonyms and falsely contended Urquhart “illegally structured a settlement to muzzle” him. “Sheriff Urquhart brings this action to vindicate his rights, to restore his reputation as one of the most highly-regarded King County Sheriffs to have ever served the County and to establish that Deputy Barnes is liable for the substantial and irreparable harm that he has caused to Sheriff Urquhart’s reputation on the eve of this November 2017 election,” the lawsuit states. His complaints, the suit claims, “reveal a long-running campaign to embarrass anyone in his chain of command who has criticized Mr. Barnes’ job performance.” The lawsuit says Barnes’ criticism of superiors and others ranges over 15 years and predates his employment with the Sheriff’s Office. The suit also noted Urquhart took and passed a polygraph test in which he denied Barnes’ groping allegations. Barnes was well-liked in Skyway, where he served as a community storefront officer, and in the Highline School District where he served as a school resource officer, records show. He had received multiple commendations and had been friends with Urquhart and supported him in his first campaign for sheriff. But in 2014, Barnes filed several complaints alleging retaliation and discrimination within the department and Urquhart’s administration filed multiple misconduct complaints against him. Urquhart said in an interview last month he was poised to fire Barnes on what he called “borderline” findings of dishonesty and other misconduct, before the county negotiated the settlement that included the payout and a job-reference letter signed by the sheriff. Urquhart said he agreed to the settlement to ensure Barnes would never work again for King County. Urquhart’s lawsuit comes amid growing complaints against him and his top aide, Chris Barringer, this week for their alleged mistreatment of Barnes and another former deputy, who last year alleged Urquhart raped her years earlier. Leaders of three political advocacy groups held a news conference Wednesday to condemn Urquhart and Barringer for allegedly seeking to discredit and intimidate his accusers by distributing records containing medical information about them. Barringer and Urquhart deny that. A complaint filed by Barnes alleging Urquhart released Barnes’ sheriff’s records to the media about him is now under investigation by the King County ombudsman. In the wake of this week’s allegations, several politicians, including several state lawmakers, Seattle and Metropolitan King County Council members have withdrawn their endorsements of Urquhart. Cathy Allen, campaign consultant for Urquhart’s opponent, Mitzi Johanknecht, denied the accusation. “We’re not harassing anyone,” she said.